A bumper crop of beans, beetroot, sweet peas and ruby chard has been harvested by a Wimborne based gardening group for people with dementia and their carers. Since March, the group has been enjoying the beautiful location of the National Trust allotments on the Kingston Lacy Estate in Wimborne. 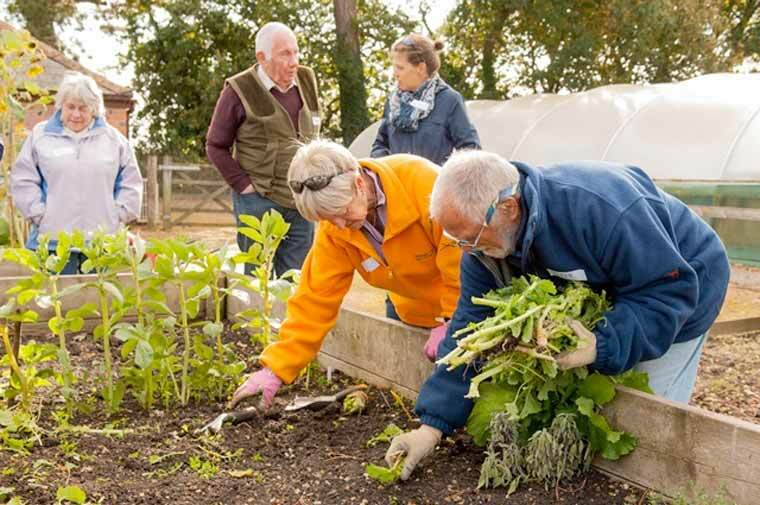 As part of the ‘Step Outside’ project set up by Wimborne Dementia Friendly Community and facilitated by the Alzheimer’s Society, gardeners have transformed patches of weeds into beautiful and productive raised beds. On Tuesday 18 October, people involved in the project gathered at the allotments to enjoy an afternoon together to celebrate their harvest. Additional funding secured by Wimborne Dementia Friendly Community means the project will be returning to the allotments in spring 2017. Mayor of Wimborne and chair of Wimborne Dementia Friendly Community Councillor Sue Cook, Chairman of East Dorset District Council Councillor David Shortell and Dorset County Councillor Robin Cook were among those who took part in the harvest celebrations. The words of one carer sums up the benefits of this project: “We like being active and outdoors and I wanted a comfortable environment for my husband, where he could carry out tasks in a non-judgemental atmosphere. We have enjoyed the friendliness and the banter, my husband has looked forward to it and been more engaged than with many other things that we do”. Anyone with a diagnosis of dementia who is interested in joining the group next spring should contact Alzheimer’s Society’s Sarah Rampton on 01202 764352. As well as this group Alzheimer’s Society in East Dorset has a number of services including Memory Cafes, Singing for the Brain and a Memory Support and Advisory Service. Wimborne Dementia Friendly Community is working on other schemes to enable to people in Wimborne to remain independent and live well with dementia. To find out more about the new or existing groups visit alzheimers.org.uk/localinformation or contact 01202 764352 or email: admindorset@alzheimers.org.uk.